An Eastern Kingbird is backlit by the glow of early morning. The Eastern Kingbird is king of its domain! 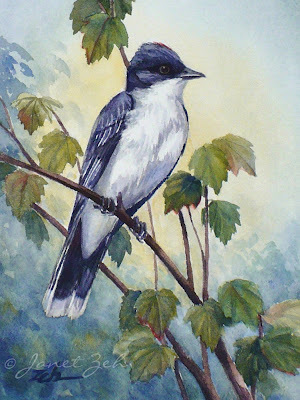 In this print from my watercolor painting, a kingbird perches on a branch ready to sally forth after a flying insect. Eastern Kingbird print is available in multiple sizes and may be ordered framed, unframed or on canvas. Click the Order Print button below for sizes, options and prices.